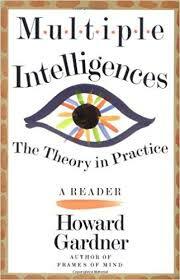 As one of the preeminent educational theorists of the 20th century, Howard Gardner challenged the traditional notion of what comprised intelligence. Rather than emphasize just one process of learning, Gardner argued that there are multiple forms of intelligence, each with their own respective benefits and drawbacks. Each of these forms of intelligence has the possibility to allow a person to solve problems or create something of value within the confines of a social or physical environment, the very core of what Gardner felt intelligence was. These seven types of intelligence demonstrate the variety of approaches that individuals can have to the learning process. Linguistic intelligence refers to a person’s ability to read, write, and speak well; individuals with this form of intelligence often excel in subjects such as reading and history. Logical-mathematical intelligence focuses on logical reasoning and problem solving, and is best displayed in science, mathematics, and games such as chess. Spatial intelligence refers to a person’s ability to think in physically abstract forms, such as in architecture. Musical intelligence describes the innate ability to play an instrument or read music. Bodily-kinesthetic intelligence focuses on one’s ability to understand the movement of one’s own body; this is best demonstrated in athletes and individuals that perform intricate physical tasks, like surgeons. Interpersonal intelligence focuses on one’s ability to interact with others, such as salespersons or counselors; intrapersonal intelligence focuses on one’s ability to look inward for the ability to solve a given problem. Gardner’s multiple intelligences adequately encompass the various types of approaches an individual can have to the learning process, demonstrating the vast differences between individuals’ abilities. Paper Masters writes custom research papers on Multiple Intelligences and Gardner and discuss Gardner's theory of learning, which is a notion that is comprised of multiple intelligence.